Galaxy shoppe is a brand new commercial project of Galaxy group located in Greater Noida West is it has a direct connectivity to Noida sec-18 metro station. This commercial hub is going to accompanied with a 4000sqft of open restaurant which will catch the attention of people. Apart from this, it has spa, salon, doctor’s area, food court, gym and a lot more. Emerged with all the ultra modern facilities it is a clean choice to shop for every age of people. This place is not only designed for the shopping purpose but for a commercial use too. If you want to start your own business you can surely go for it. For a future business assistance just book your space today and become a game changer. Galaxy North Avenue 2 is one of the most well designed residential projects which is presented by Galaxy groups. These residential apartments are well furnished which matches with all the international living. Being located in the prime location of Greater Noida it is the best place to reside in. Accommodated with gym, swimming pool, spa, salon, children’s park are the new attraction for people around Delhi-NCR. 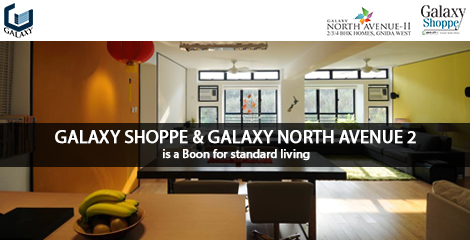 For a better living, Galaxy North Avenue got everything you required. Connected with all nearby Delhi-NCR areas it is a perfect place to stay in with your family. Don’t wait any long for your dream house, book it today and let your dream come true.